In the heart of Dolomites, surrounded by the sea of volcanic rocks! 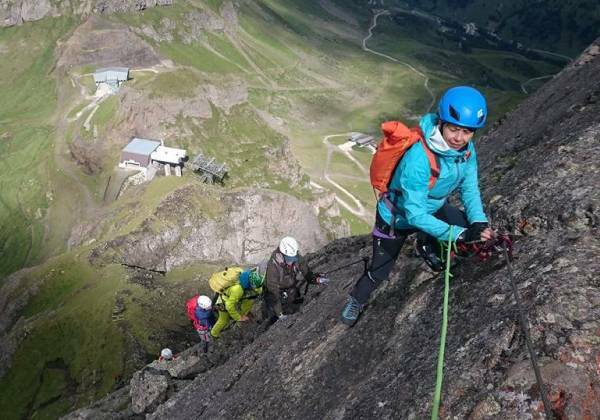 It’s a marvelous Via ferrata, exposed and demanding, overlooking the Marmolada Glacier and Sella mountain range.. Not recommended for beginners, more suitable for experienced climbers looking for a new challenge. In addition to being physically demanding, this via ferrata is situated in one of our favorite mountain ranges. Nature, geology, history are inseparably intertwined. One of the best ways to fully absorb Dolomites all in one. From Arabba, small ski resort, we’ll ascend to 2480m to Porta Vescovo,. Short distance away, we’ll reach the beginning of the via ferrata. Immediately your technical skills will be put to the test. An imposing vertical rock will be blocking our way, waiting to be capered. Once reached the top, we’ll find ourselves on the narrow ridgeline of the crest, passing through steep passages, but with the magnificent panoramic views after each step. Some tranches stand as a reminder of the WW1 second line of fighting, in front of the Marmolada Glacier. Via Ferrata ends at the crossroad between Bivouac Shelter, and a smaller path which will take us to refuge Passo Padon. A path will take us back to Porta Vescovo, from which by lifts we’ll return to the car park. Health and fitness requirements: Participants should be moderately/high fit and in good health. Any health issues must be communicated upon booking, prior to undertaking any physical activities related with the chosen programme. This is for your own safety and the safety of the group! Clothing and equipment: Technical alpine clothing, harnessa, ferrata kit, climbing helmet and shoes or approach shoes, 20l backpack, energy snacks. Technical climbing equipment may be rented out from Travelsport.